Founded on a determination to have a positive impact on the world, Toms Shoes is a revolutionary kind of company that is focused on helping those in need. Not only does Toms create some of the most stylish, functional shoes on the market, but they also donate a pair to a child not fortunate enough to have their own shoes every time you buy a set. It’s called their One for One model and it’s changing the way businesses conduct themselves. When Blake Mycoskie was traveling in Argentina, he was struck by the poverty and health conditions. Images of children walking around without shoes stuck with him, and so he started Toms Shoes in 2006 to try and create a better tomorrow. During his inaugural year of business, Blake was able to donate 10,000 pairs of shoes. By September of 2010, he had given his one-millionth pair. The most iconic Toms shoe is the Women’s Classic. As the embodiment of the timeless Argentine style, this model comes in more colors than most people can even handle. Made with a natural canvas, soft leather insole, and textured EVA outsole, these shoes are perfect for any number of activities and encounters. With so many stylish options, it is not frowned upon to stock up with enough pairs for every day of the week. If you are feeling in need of stepping up the glam factor, then just opt for the Toms Women’s Glitters Classic Shoe. They are everything that make the Classics so supreme, plus a heavy dose of sparkle. These slip-ons don’t just ask for attention, they demand it. Toms likes to keep it sweet and simple. That is just what they do with the Desert Wedge Shoes. With a touch of elegance and a flair for constantly looking good, these suede babies know how to handle the office, the coffee shop, a night out, and everything in between. More than meets the eye, the Toms Cordones bring plenty of comfort and style in a package that will have you wondering why you didn’t get onboard sooner. These guys have eyelets to give you the option to lace them up, or don’t, because they will stay secure on your feet thanks to hidden elastic straps. A super durable sole instills confidence that you can log many miles doing whatever you love to do without ever having to worry about failed footwear. 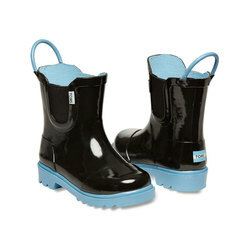 The Toms Botas Shoe is also a supreme choice for anything from stepping around town to just kicking it at the park. Loaded with a latex arch support to keep your foot in a happy place, these higher cut kicks give you a versatile option that will seal the deal on any scene. You want shoes that feel good on your feet, and ones you can feel good about wearing. 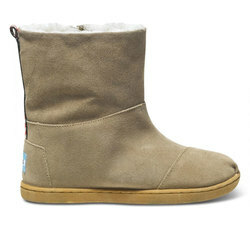 Toms delivers both sensations by allowing you to enjoy stylish, comfortable footwear of your own, while knowing that your choice helped out a child in need too.